Coming soon to Fort Lauderdale Beach: The Ford Lauderdale Air Show, featuring the Canadian Forces Snowbirds as well as a lineup of U.S. military and civilian performers. 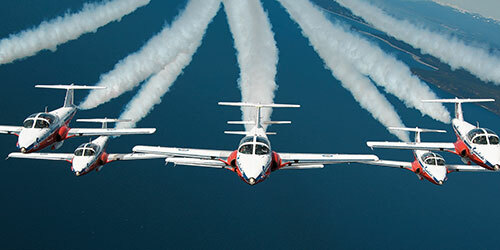 The Snowbirds — officially known as the Canadian Forces 431 Air Demonstration Squadron — will headline the show, May 6-7. The Snowbirds are comprised of Canadian Armed Forces pilots and National Defence Public Service Employees who perform the aerobatic shows. “The Snowbirds will be our jet demonstration team this year, and the Thunderbirds are going to be returning in May 2018,” says Bryan Lilley of B. Lilley Productions, president of the Ford Lauderdale Air Show. The Show will also include a demonstration of the U.S. Marine Corps MV-22 Osprey, a tilt-rotor helicopter. The Marines and the U.S. Air Force operate a total of 112 MV-22s, which work as a helicopter when taking off and landing vertically and as a turboprop aircraft once airborne. Sean D. Tucker, who has been flying airshows worldwide since 1976, will perform aerobatics in his stunt bi-plane. His precision maneuvers include The Centrifuge, Double Hammerhead, Alley Oops, Forward Flip and the Triple Ribbon Cut. Look for him to fly backwards as well. The Show was renamed the Ford Lauderdale Air Show last year to reflect South Florida Ford’s involvement as title sponsor. “It really adds to the prestige of the show,” Lilley says. For more information, or to purchase tickets for the Drop Zone Beach or Flight Line Club VIP areas, call 321-395-3110 or visit fortlauderdaleairshow.com.